RESEARCH TRIANGLE PARK, NC--(Marketwired - December 17, 2015) - Most surveyed pharmaceutical and biotechnology companies tie their investigator-initiated trial (IIT) milestone payments to patient enrollment criteria, according to a recent study by Cutting Edge Information. According to the research, 87 percent of companies will not provide investigators full compensation unless they hit their target enrollment metrics. Once an investigator receives the green light from a company's approval committee, Top 25 and small pharmaceutical companies use milestones to help track clinical trial progress. These milestones are often connected with clinical trial payments and are separate from the routine updates that many companies already require. According to an IIT director at one Top 25 company, everything is contractual and milestone-driven: if goals are not achieved, investigators are not paid. Essentially, companies pay investigators based on the level of work they perform. If companies have to terminate studies early because investigators are unable to recruit sufficient numbers of patients, they will prorate the work and request that additional funds be returned. 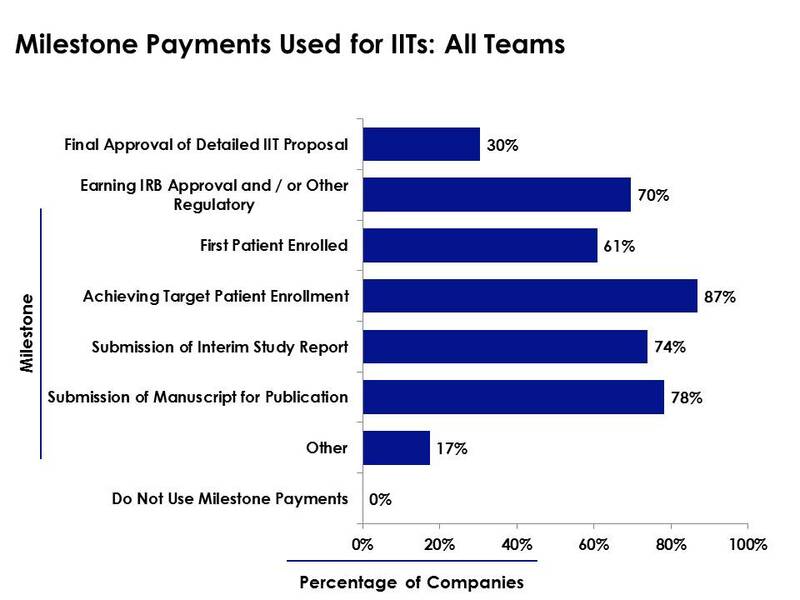 Milestone payments serve a dual purpose of ensuring that trials stay on track and that companies remain prudent as they continue to fund IIT trials. "A majority of companies will not provide next-level clinical payments unless investigators achieve target patient enrollment," said Natalie DeMasi, senior analyst at Cutting Edge Information. "Another 61 percent of teams require the investigator to have enrolled his or her first patient before they will provide the next large clinical payment." The scope of team responsibilities may affect the percentage of companies using specific types of milestones. At the global level, teams report relatively even rates of milestone payment usage -- with one primary exception. 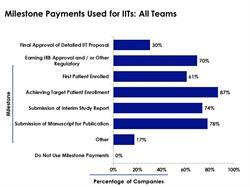 Only 43 percent of global teams tie final IIT approval into trial payments. By comparison, 92 percent of U.S. and 100 percent of surveyed ex-U.S. teams give precedence to target patient enrollment-based milestones. Additionally, compared to the overall average, U.S. and ex-U.S. teams are more likely to connect trial payments with publication requirements (83 percent and 75 percent, respectively). Of note, institutional review board (IRB)-facing milestones are also an important consideration among ex-U.S. teams. While 100 percent of ex-U.S. teams report use of IRB-based milestone payments, only 71 percent of global teams and 58 percent of U.S. teams report doing the same. For more information on Investigator-Initiated Trial Management: Expedite Approval Timelines and Establish Compliant Funding Practices, please visit http://www.cuttingedgeinfo.com/research/medical-affairs/investigator-initiated-trials/. According to a study by Cutting Edge Information, 87 percent of life sciences companies will not provide investigators full compensation unless they hit their target enrollment metrics.